A car has travelled 50 miles at 70 mph. It started its journey with eight gallons of fuel but its tank has been leaking throughout the journey and is now dry. The car completes 25 miles per gallon. it had used 2 gallons of fuel. the journey of 50 miles. I think that was for me but unfortunately engaged with police and undertakers until after 2a.m. that night.Well done Ray .I can see you enjoyed the question. I found the airplane one manageable by breaking the flights into degrees of the circle.i.e. a full tank allows 180 degrees of travel. I've been ruminating this since last night. If you turn 2 lights on, you will know which switch the unlit light belong to. How do you know which of the 2 lit lights is which. I think you switch one light on first, and leave it to warm up. Then turn any one of the 2 remaining switches on. You enter the room, and the switches of the 'warm bulb plus the 'lit' bulb can be determined. 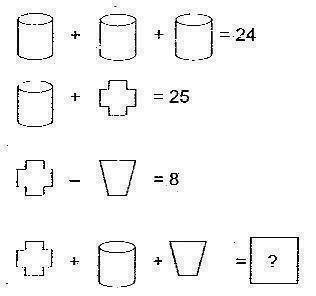 Solve the mathematical equation in the picture below. decode this picture and tell me what it says ? The second symbol is 2 cubed, which would translate as eight = ate. because it is used in calculus for that function. 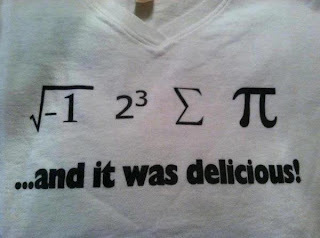 The fourth symbol of course is ‘Pi’ = pie. I have it, there is no solution to a negative square root. The number is called an 'imaginary' number and is denoted by the letter 'i'. I posted too early, should have thought it through. Lol There's no fooling you. percent profit will be made if it sells at the new amount ? The profit will drop to 40%. The reduction will be 10% of the 150% price so would result in a 35% profit.